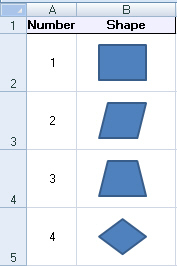 The first 4 rows of autoshapes (the final worksheet should have 137 shapes in). To get a neat-looking effect like this, use the measurements shown below. Set the ColumnWidth property of the shapes column to 15. Set the RowHeight property of each row containing a shape to 50. Position each shape 20 points in from the left edge of its cell and 10 points down from the top, and give it a width of 40 and height of 30. When you've finished, save this workbook as Drawing palette of autoshapes, then close it down.